I found this series by browsing around online at the websites of the various manga publishers. 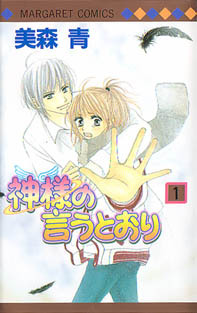 The cover looked very cute (adorable boy, feathers, startled girl, hey, that looks fun!) and I found a brief description of the series, and after deciphering it with my poor Japanese skills, this looked like a good series to take a chance on. I like the art style, though at times it goes a little too scratchy, but for the most part it’s clean and nice-looking. I am not usually a fan of the art styles that show up in Margaret magazines, but this one grew on me. The story is a little bit familiar (then again, I say that about most series) but I look forward to getting more of it. he plot of this one reminded me a little bit of Arina TANEMURA’s ‘Full Moon wo Sagashite’ except without the idol singing and transforming ^_^; The heroine of this story, 16-year old Ayumi, is an average high school girl. She has a crush on a classmate, the 15-year old Musashi. He treats her as a friend though. One day at school, Ayumi is startled to hear someone call her a slow, dumb girl. She turns and sees a strange boy sitting in the window. She asks him if he was talking about her, and he freaks out, as if startled that she can see him. He immediatly jumps out the window. Considering that they are not on the first floor of the school Ayumi is shocked to see the boy jump out the window, and evem more shocked when she (and the classmates who came running when she screamed) looked out the window and saw no sign of the strange boy.